Forgiveness is possible. In The Beginner's Guide to Forgiveness, author Jack Kornfield explores why forgiveness, personally and globally, is essential to our health and happiness and how you can start using this timeless practice to transform emotional wounds into healing and understanding. Drawing from his background in meditation and psychology, Kornfield reveals the path to forgiveness and the way out of our pain. "You will see it when you believe it." We all like the idea of forgiveness - doing it is the hard part. If you're holding an old grudge, feeling guilt, or shame from past events, or simply unhappy with the way your life is working out, then you're ready to start testing a set of tools for real change. 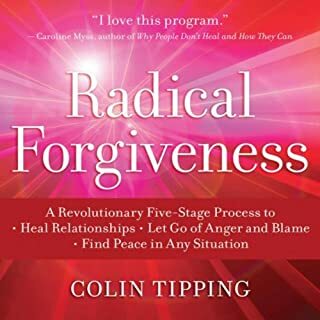 With The Power of Radical Forgiveness, Colin Tipping invites you to learn a whole new way to acheive forgiveness. Are you tired of bearing old emotional wounds? Do you feel blind to the abundance all around you? How long has it been since you felt truly happy? Three audiobooks in one: An unbeatable combination of the world's best forgiveness strategies, gratitude boosting techniques, and powerful ways to increase happiness! Are you tired of suffering from the pain of old wounds that won't go away? Do you wish you could just let it all go and be truly happy again? Whether you want to (1) eliminate negative thoughts and emotions, (2) let go of grudges and thoughts of revenge, or (3) free your mind and be happy again, then this is the audiobook for you. Don't let old grudges and negative memories ruin your valuable time on this planet. The devastating effects of the inability to forgive and let go are well documented. In this audiobook, I will show you straightforward forgiveness strategies that can boost your physical and emotional health! Forgiveness is a powerful gift that you give to yourself. If forgiveness were simple and straightforward, there would be no need for this audiobook. Forgiveness is the often complicated and tricky process of responding wisely to the emotional pain we suffer. Forgiveness is not the same as condoning wrongdoing. We can forgive without setting ourselves up for further wounding. We can refuse to let the other person hold our happiness captive forever! At the same time, forgiveness sees the danger and sets up effective countermeasures to prevent the person from wronging us again. Forgiveness frees you to live in the present. Don't settle for less than your true full potential! Learn what you can do in order to forgive and move on to a healthier, happier, and more enjoyable life! Experience the healthy, happy, and meaningful life you were meant to live! Free yourself: Buy It Now! It is not uncommon for people to hold grudges to people based on events that have happened in the past, but it is learning forgiveness that is the key to finally letting go of these bad memories. This book will help you to push away those bad thoughts and allow you to move on for a happier life. There are so many people who feel as though they cannot forgive someone for something they have done in the past. The truth is that holding grudges takes more effort and more negative energy than forgiving a person or even yourself for something that has happened in the past. This book will give you exercises and a guide for how to learn to forgive. Not only will it help you to forgive and make peace with yourself, but it will also help you to move forward in life, help you to become happier, and heal yourself. The best message about this book is that forgiveness is for the benefit of YOU, not anyone else. I would strongly recommend it; especially for someone who is holding on to an event from the past-- forgiveness could be the solution to your happiness. Would you consider the audio edition of Forgiveness: The Healing Power of Forgiveness to be better than the print version? I think both versions are very good. I like the audio version because I can play it at work and still do my work. It helps sometimes to actually here the ideas in a book rather than to read them in order for them to stick and bring the message in a little clearer. I am usually pretty good about forgiving others, but very hard on myself. I liked the chapter on forgiving yourself and found the suggestions, activities and exercises very easy to do and they worked. Joshua Mackey has a very professional, yet personable voice and his vocal inflections always make me think this is the most important thing I will hear today. What insight do you think you’ll apply from Forgiveness: The Healing Power of Forgiveness? There is so much insight that will be applied to my daily life from this book. From learning how to control emotion, be grateful, turning around my perspective to better understand others and understanding what forgiveness is, each helps to make life better so that you don't hold on to negativity and are able to forgive. This book had many exercises from which to choose and all of them are easy to do and make sense. You might be able to find some of this information elsewhere, but this book pulled it all together and put it in one place. Hearing the audio book made the message come through louder and clearer. The healing power of forgiveness is within your grasp with this book. Learn how to practice controlling and expressing emotion in a healthy way. This book will help you put strategies in place to replace negative philosophy with positive and create a new lifestyle of forgiveness. Feeling love and gratitude will change your life and help you pass on the healing power that comes with an attitude of harmony and forgiveness. The most important is the hardest-learn to forgive yourself and heal for a healthy life. This book is a must have for anyone who wants a more peaceful and happy time on earth. What did you love best about Forgiveness: The Healing Power of Forgiveness? I think sometimes one needs a reminder that we should let go and forgive as we get caught up in our busy lifestyles. I loved that it acted as a great reminder for me to think about all that I have to forgive and let go. The narration is exceptional as if I am talking to someone in person who is teaching me about this book. This brought out a lot of intense emotions as it really dives deep into not only the science behind forgiveness but the holistic approach to applying forgiveness in all areas of your life. I would recommend to anyone who holds a lot of grudges or sweats the small stuff frequently. As with all books narrated by Josh Mackey, in this book he kept me engaged even when going into specific jargon. He sounded so engaged and interested in what he was talking about that he encouraged me to feel the same way. This is one of my favorites. Forgiveness is a tough topic to make sound enticing and he definitely does. If I could have, I would. Instead I started my day and ended my day with it. It put me in a great mood. Really helped me forgive various people! This is a great audio that gives solid strategies for releasing anger, forgiving people and moving forward in your life with a happier and more positive outlook. I especially liked the use of gratitude to help in the healing process along with how to let go of nagging memories and even how to forgive yourself! This is something everyone should listen to. Highly recommended! What I loved about Forgiveness: The Healing Power of Forgiveness was the many different exercises and ways to forgive people. I learned that even holding grudges can make you sick! 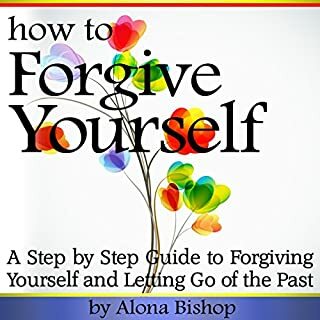 This audiobook was filled with so much interesting information and positive exercises to become a more forgiving person. It can surely help anyone. That is what I love about it the most. What was one of the most memorable moments of Forgiveness: The Healing Power of Forgiveness? One of the most memorable moments in Forgiveness: The Healing Power of Forgiveness was in chapter five; positive thinking. Learning the ways of positive thinking, and of a very interesting quote by Albert Einstein, was very memorable to me and helped me to really focus on thinking positive and forgiving people and situations. His strong voice. He commands your attention and helps you really lose yourself in this wonderful audiobook. In chapter three, learning to switch perspectives was something I feel I will always remember. There are two sides, or perspectives, to every situation. I feel that, knowing this, it will be easier to forgive and move on from certain situations. 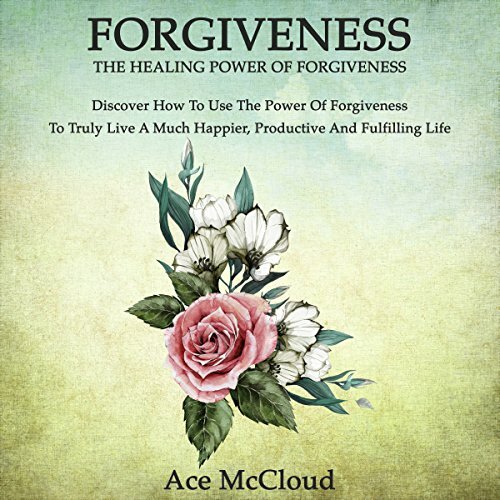 Ace McCloud yet again helps you live a happier and healthier life thanks to his book, Forgiveness. 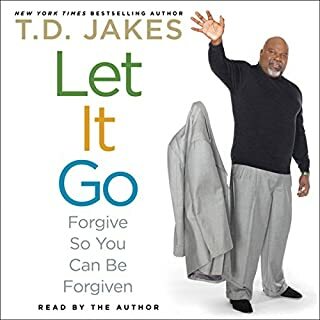 As someone whom has lived with a lot of anger and resentment, this book has helped me let go with some helpful tips and reasons to forgive. Mr. McCloud can change your life and perspective on things in Forgiveness: The Healing Power of Forgiveness: Discover How to Use the Power of Forgiveness to Truly Live a Much Happier, Productive, and Fulfilling Life. Thank you, Ace! Would you listen to Forgiveness: The Healing Power of Forgiveness again? Why? Yes I would. It is a very well written book and I love listening to Joshua Mackey read it to me. There is great advice and tips on how to forgive and how to switch perspectives to let go. 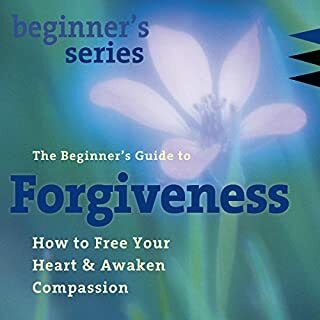 Forgiveness is something I think we all have struggled with at least once in our life and the author teaches you the positives in forgiving someone. I will remember chapter 2. Write down all the people you love and then visualize those people. Interesting exercise. You really will be much happier in life if you learn to forgive people for their mistakes and move on. Let go and set free of the negative! I found this audio-book really helpful in giving me some strategies to let go of grudges and move on with my life. In particular, the chapter on self-forgiveness was emotive and powerful and made me re-evaluate my attitude towards myself. It's easy to follow, well narrated, and contains lots of helpful breathing and visualization exercises to help get you to a place where you can forgive others, yourself, and spend that negative energy you were focusing on being angry, on something more positive. I have already listened to Forgiveness a number of times. The first time I was very struck by the original and interesting idea that forgiveness can be so important to our sense of well-being. The most memorable moment for me was the realisation that we each carry around so much baggage from past experiences whether we realise it or not. These past experiences, if not fully resolved, can impede our way forwards and prevent us from living the happy, fulfilled lives we would like to. The key is to find forgiveness, of ourselves and others. The enthusiasm and urgency the narrator brings to the audiobook really helped my enjoyment of the content. The idea of forgiveness is such a deep-seated idea in culture and in many world religions it did feel quite a profound idea to consider and I was moved by it. ...starting with yourself. That is the most valuable lesson I've learned while listening to this audiobook. There's even a wonderful self-forgiveness checklist. You can't forgive others fully until you forgive yourself. And there's no need to go around beating yourself up your whole life over simple mistakes - even big ones. That kind of thinking only allows others to do the same. This is a wonderful audiobook that I would recommend to anyone in any situation. I've listened to several of audio books now and in my opinion this ranks very high on the list because of how important the lessons and techniques are that are detailed within. 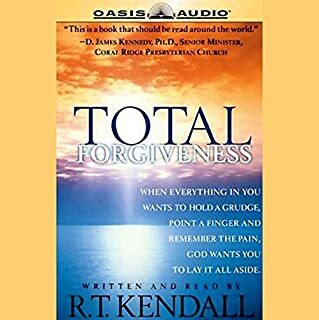 It's a topic close to us all because we all have to forgive someone at some point in our lives and this book is excellent at driving home how much better you feel personally if you just forgive and move on with your life. What I liked best was the focus on the benefits that forgiving someone gives to you. It doesn't just say you should forget it, but accept it and move on. The way it breaks down how to forgive not just others, but yourself, is very impressive. It details a range of techniques that make a lot of sense when trying to stay in control of your emotions and not act irrationally. With a topic like this the narrator is very important for emphasizing key points to the listener. Mackey does a great job throughout of doing this and is thoroughly engaging throughout. I would deem this a must-listen because it contains so many aspects to forgiving someone and useful techniques to go about doing it. The self-forgiveness checklist is also very important to listen to in the book. I like how the author describes forgiveness,"Compassionate feelings that support a willingness to forgive"
Full of insights and wisdom. Forgiveness is a gentle listen, full practical wisdom which (if applied) could save you from so much wasted energy, anger, resentment and pain. Ace shows the reader how to deal with anger and negativity, how to re-write the stories we tell ourselves when we feel that someone has betrayed us and how to re-focus our attention onto things that work for us, rather than against us. I found the consideration of alternative explanations from the point of view of the person who we might feel has wronged us, extremely helpful. Forgiveness does not expect us to forgive and move on in the first instance, but rather gives us the tools to deal first with the pain and anger of betrayal, then look at practical ways to invest our energy into moving forwards. Ace doesn't encourage us to forget, but rather to use what we have learned to help us make better choices in the future. This is a book about redeeming the worst of situations so that they become positive opportunities for us to learn and grow, rather a negative drain on us for the rest of our lives. Joshua reads with kindness and encouragement, bringing the ideas to life. As with many of Ace's books, Forgiveness also contains some excellent links to other useful resources that can be used to support a journey towards forgiveness. 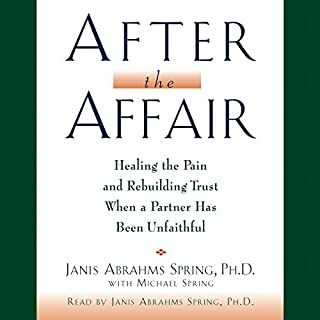 If you're struggling with the pain of betrayal this book is a good place to begin your journey back to internal peace. Very useful, I certainly will be making a note of some of the techniques therein that are easily applicable to day to day life and events. Learning how to let go and move on is extremely difficult and this book gives great advice on how to move forward. This book will remind you of all the benefits of being a positive person that holds no grudges and the reasons why you need to forgive yourself and the others for your own peace of mind. It can also help you understand and learn more about forgiveness and will give you techniques and suggestions to help you deal with your emotions.